Use our online SALTO electronic door lock configurator to create your customized door and personalise all the options. Select a model, door type and customize your electronic lock with a broad range of colours, finishes, handles & functions. The next level of connectivity with your guest. AElement Fusion is an electronic lock with a sleek reader accentuated by an interactive light ring that illuminates when access credentials are presented, providing a minimalistic design that blends with any hotel décor. The AElement Fusion is compatible with RFID, NFC and BLE (Bluetooth) technologies that integrate seamlessly with mobile applications including SALTO Systems' JustIN Mobile. AElement is an RFID lock that allows you to integrate all your physical security needs into one stylish, energy efficient, reliable, wire-free system. 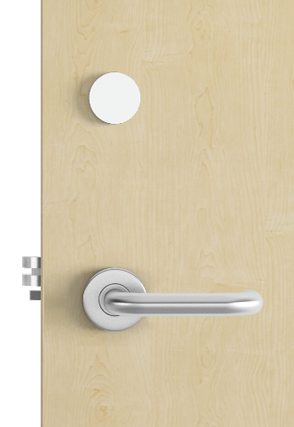 The minimalistic design of its RFID reader looks chic and discreet on any door and can be combined with a wide range of SALTO and designer handles. 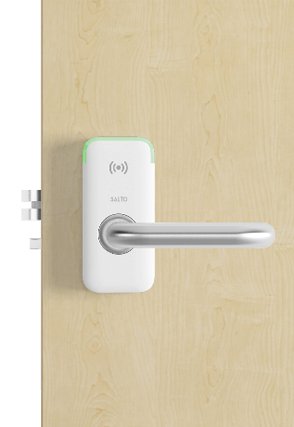 Incorporating SALTO´s DNA technology, AElement allows users to choose between the online and offline world as all locks are designed to be wireless ready right out of the box. Users simply choose the mode of operation they want, Wireless online” or “Wireless ready. Stylish design is a SALTO trademark, and with the new XS4 One we raise the bar on this already high standard. The SALTO XS4 One, thanks to its small discreet size and modern, clean LED aesthetic, simplifies installation in virtually any kind of door. 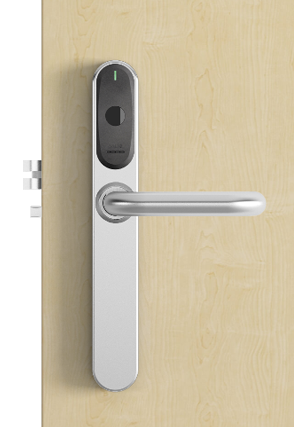 It’s the ideal solution for any door where there is a need to control access. SALTO XS4 One is an evolution of the XS4 Original model with a new sleek built-in reader that is available in two colours – black and white – and in seven different body finishes that look great on any access point or door. 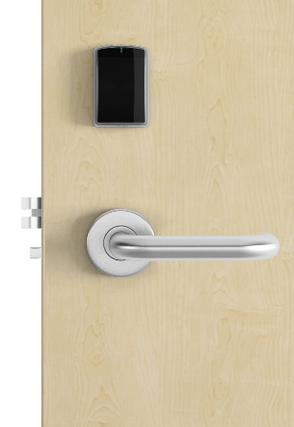 Designed with the latest RFID access control technology, the XS4 Original wireless lock is stylish yet durable and easy for guests and staff to use with smart cards or smartphones. It offers a wide range of functionality and finishes in addition to a high security protection provided by highly resistant, hardened anti-drill plates to protect wiring and readers area. Additional protection provided by solidified axes and floating steel balls in the handle area. The XS4 Mini’s smart compactness simplifies installation in virtually any kind of door, complementing any type of atmosphere. 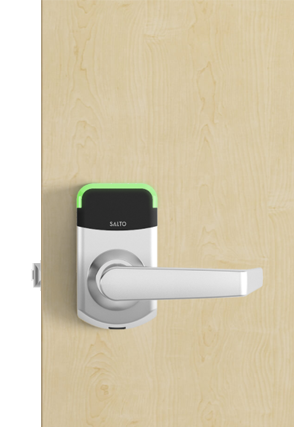 Add a modern, sleek aesthetic to any door and setting with SALTOs latest electronic lock that combines smart and attractive design with the latest electronics. Plus, thanks to its ground-breaking design, the XS4 Minis no-drill install is fast and easy on labour, while also maintaining doors fire certifications. Its also great for retrofits across a wide range of markets and conditions, and is available in black or white covers, plus with a variety of handle shapes and finishes. 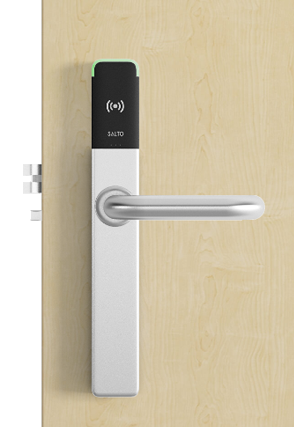 Add a modern, sleek aesthetic to any door and setting with SALTO´s latest electronic lock that combines smart and attractive design with the latest electronics. Plus, thanks to its ground-breaking design, the XS4 Mini´s no-drill install is fast and easy on labour, while also maintaining doors´ fire certifications. It´s also great for retrofits across a wide range of markets and conditions, and is available in black or white covers, plus with a variety of handle shapes and finishes.